Last week, Architecture.mnp posted a few images of what might possibly be the nicest Kentucky Fried Chicken restaurant ever built. Ever. The contemporary building looks like it was appropriated by the fast-food giant, but no — it was apparently designed for no other reason. Looking at this thing, I was immediately reminded of a restaurant here in San Francisco, Spork, that expresses the exact opposite condition: a building that looks like, and in fact, used to actually be a KFC, but now serves contemporary cuisine. Approaching Spork in San Francisco’s Mission District can be a bit of a disorienting experience — almost like walking past a James Turrell piece. It feels like a fast food restaurant, yet the modern, slate grey exterior is a confusing giveaway. Named after KFC’s signature utensil, Spork retains just enough of it’s predecessor’s, uh..distinctive charm to disrupt and de-familiarize the fast-food typology. 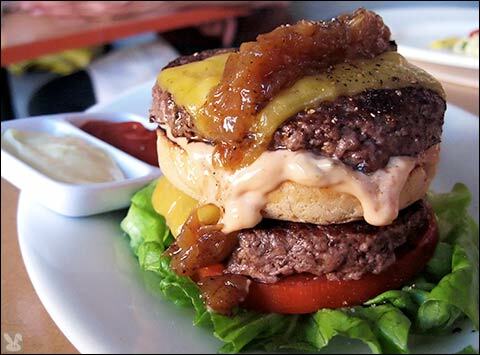 That inside-out burger looks AWESOME!! !